Dads need a little self care too. I’m sharing 6 self care tips for Dad and why they’re important in this post written in partnership with Mirum. Dads are underappreciated but they are more important than we give them credit for. Remember that time I talked about why mental health counseling is important, well self care is important too. Dads are the foundation for our families. Good self care allows Dads to be more present for their loved ones and also shows the next generation of Dads that self care is necessary and important. Today, I’m sharing 6 self care tips for Dad and why Dads need a little self care too. I get it, having a Dad bod is cute but what’s even more attractive is taking care of your body. Exercise is an important part of self care because not only can it help strengthen your body but it can be a good release as well. How many times have you exercised and had a completely clear mind? Probably all of the time, right? Well, that’s why exercise is my first self care tip on the list. Exercising will re-energize you and can be therapeutic. After losing Tristan, exercising is something that my husband tends to do a lot more often now. It allows him to grieve in a positive and healthy way. Everyone loves a good massage so why not give dad a massage or gift him with one? Massages will get all of those kinks out and Dad will be more relaxed after. Watching what you eat is as important as exercising. After a loss, eating whatever is in your path sounds like. A balanced meal can not only help Dads perform better throughout the day but it can also help them to stay healthy. So skip the junk food and only indulge during dessert or for special occasions. 4. Spend time with your family. This one is so important and probably one of my favorite self care tips for dads. In our home, family time is everything. Not only do we have weekly family meetings but we spend a few nights out of the week playing games before bedtime and we have movie night every Friday night. The key to making family time successful is to do something that everyone likes to do and ditch the cell phones. 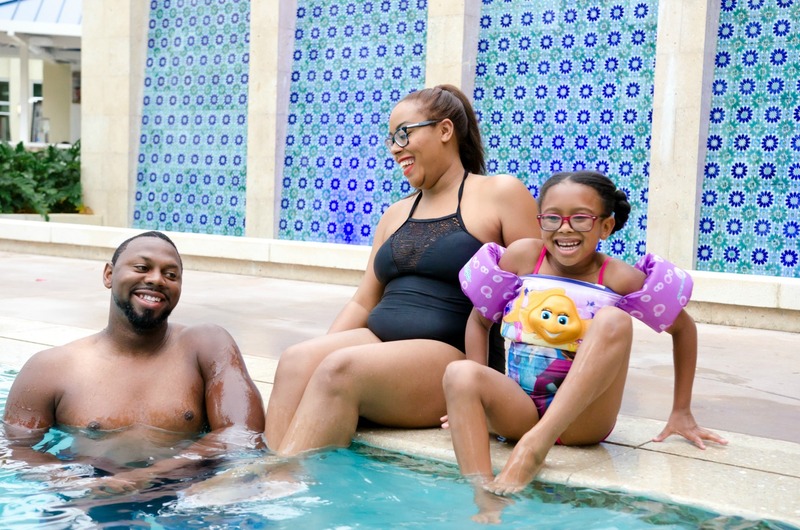 I shared some tips here on how to have a successful family getaway. If you find that you can’t carve out time during the week to spend time with your family then dedicate the weekend to them. Talking is something that is hard for a lot of Dads but communication is key to any successful marriage and family structure. I’m big on talking and my husband isn’t but he’s warmed up to it a lot and our marriage and family has flourished. It doesn’t help that Tatiana is a big talker too but it’s good to have her on my side. If you find that it’s hard to get your husband or Dad to talk, that’s okay. When Tristan passed, it was hard for my husband to open up to me at first but I was okay with that because I knew that he was opening up to one of our friends who had been through a similar experience. The funny thing is that I was actually happy that he was talking to him and not me. He could give my husband better advice than I could because he had been there. He’s a Dad and he gets it. He gets what it’s like as a Dad to lose a child. I didn’t. I could only understand what it was like as Tristan’s mom. 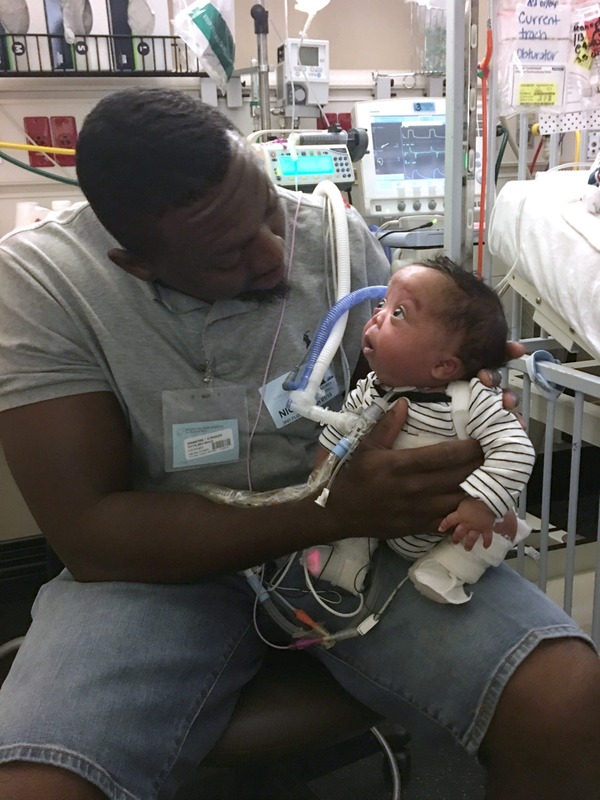 Dads experience different feelings and their bonds are different than a mother’s bond. Dads and their children have a unique bond that I can’t understand so I waited until my husband was ready to open up to me, and I was there to listen when he was. 6. Indulge in things you love. As a mom, this is my favorite self care tip and I try to do this often. For Dads, this is super important. Often times Dads spend so much time working and providing for their family that they forget about themselves. Let your husband indulge in the things he loves but of course within reason. For example, my husband loves three things: showers, his mustang, and Florida State football. When he comes home from work, he takes his time in the shower and we don’t bother him. Sometimes after work he likes to work on his mustang and I’m okay with that too. It’s something that he loves and it’s a healthy release for him. Florida State football…this one is probably my least favorite because during football season it’s our life but I’ve come to terms with that too. It makes him smile so I go along with it. 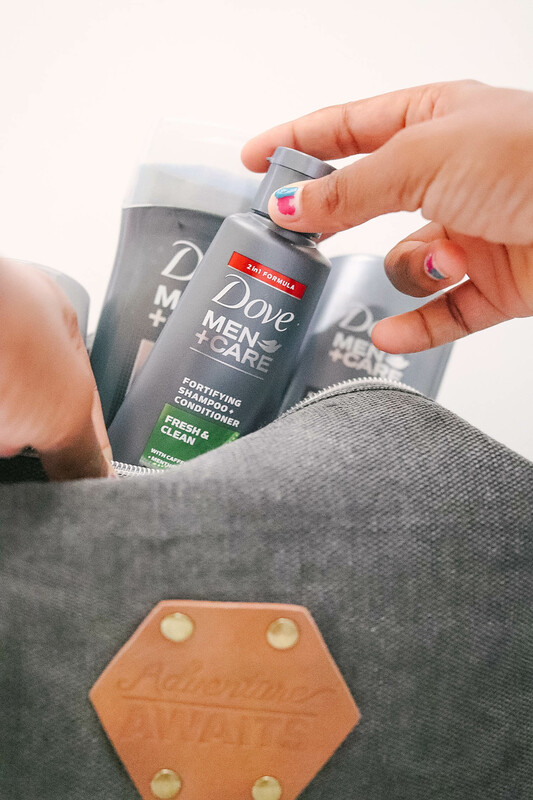 For Father’s Day this year we’re gifting him with his very own self care travel kit that he can use at home or on the go. 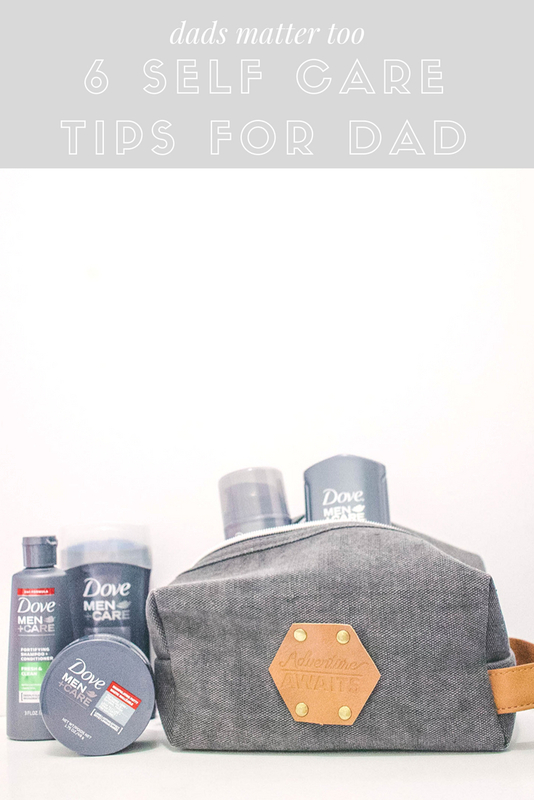 It’s filled with his favorite Dove Men+Care shampoo, deodorant, hair gel, and foaming body wash that we picked up at CVS, all to keep Dad looking and feeling his best. His kit will make it super easy to care for his self each and every day. That travel kit is a great gift for Father’s Day. I might just pick one up for my hubby, too. I love these ideas. My husband does so much for our family, and he’s been our rock for years. 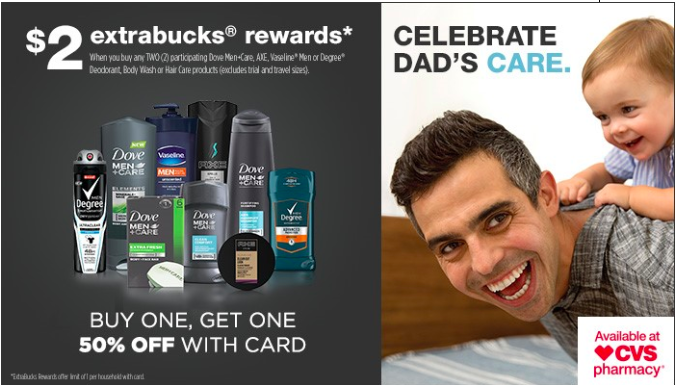 He deserves some major pampering this Father’s Day. That picture at the top is absolutely adorable of father and baby. I love these ideas. Pampering dad is a great idea, and one we don’t think of doing often enough. I think a lot of people forget about self care for dads! 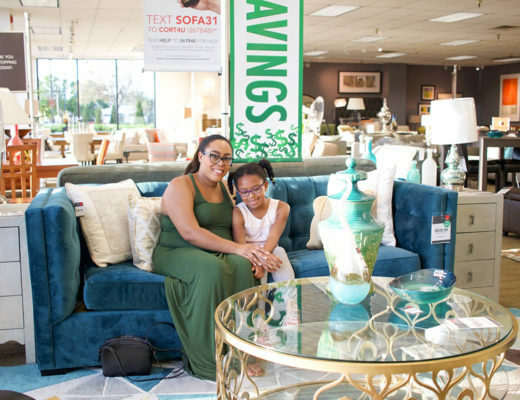 I agree – family time is essential! I love your entire message here mama! Dads are so important and you’re very right, underappreciated. Their self-care is truly just as important – no matter how strong they act. Thank you so much! We definitely have to look past their strength and subtly push them to take time for self care too. My husband loves Dove Men + Care. 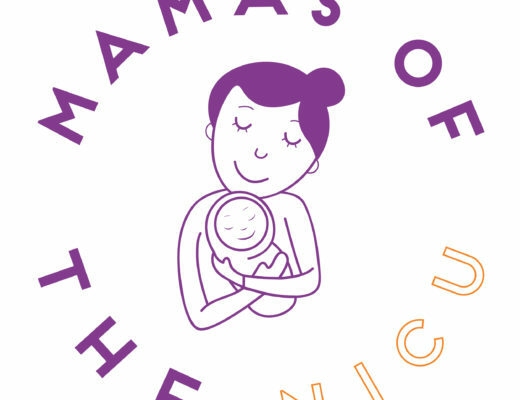 I think self care for dads is important, and moms too! I could use some about now! These are all wonderful tips. I certainly love the Dove brand myself. I use it all the time. I know that these would make for some wonderful gifts too. My husband loves Men’s Dove products also. I have bought him many of these products as gifts and it’s always been a hit. I love these tips for dad! Self care is so important and dads need the extra reminder. 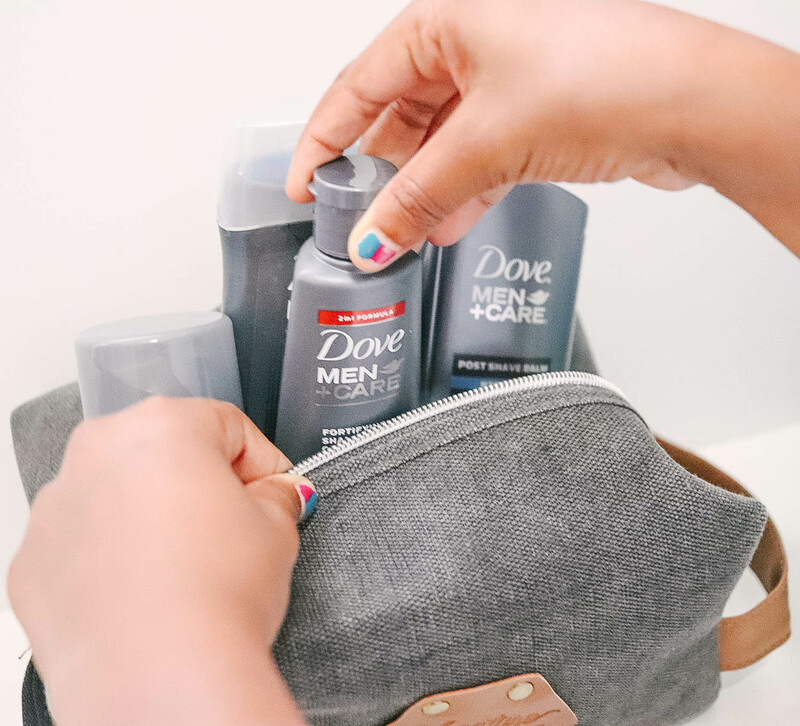 My husband hasn’t tried Dove For Men yet – I will have to share this with him! After the first few years of intense parenting we discovered that both of us suffered when we didn’t take time for ourselves. Great tips! This was us too! Once we started taking time for ourselves we were so much happier. These are awesome care tips. I will definitely send this to my husband! This is such a great post! Awesome reward ideas for dads! I think all of these are great ideas for the dads out there. I think a lot of dads are like moms and don’t take time for themselves so these things get missed in their lives. These are great tips. My husband works so much, and when he is home he’s taking care of stuff around the house. He definitely needs some R&R!